The earliest record of a mill in Wrawby is 1585. 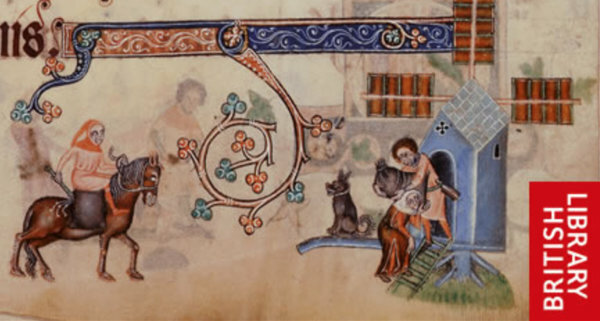 This charming picture from the Luttrell Psalter, made for Sir Geoffrey Luttrell of Irnham, Lincolnshire around 1330, gives an idea of an early local post mill. The present post mill was built around 1760 on the site of an earlier mill and was restored to working condition in the 1960s. The mill, high on the Lincolnshire Wolds, is the last surviving post mill in Lincolnshire, and indeed in the north of England. It was part of the Elwes estate until 1910, when it was sold. The mill continued in operation until 1940, when the loss of a sail brought it to a standstill. By 1961 it was ready to collapse - see picture inset - but it was saved by a locally formed preservation society. The restored mill reopened in 1965, when it ground its first bag of corn in 25 years. 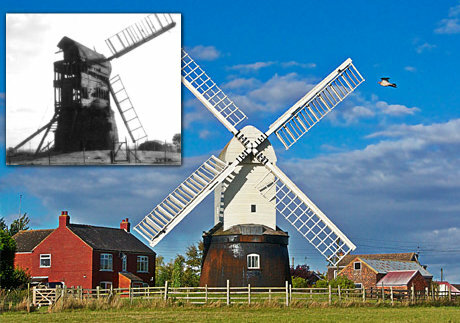 The mill has since been refurbished, the first new sail being added on 1 June 2007 and a second subsequently. There are regular Open Days, and admission is free. For details, check our Events and Calendar pages or any issue of Wrawby News magazine (downloadable here). Wrawby is situated on the hilly edge of the Lincolnshire Wolds, a few miles east of Brigg on the A18, in the unitary authority (ie county) of North Lincolnshire. 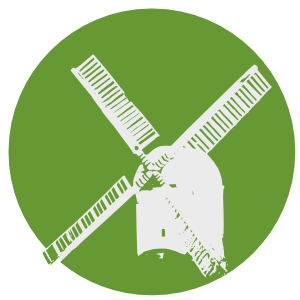 Its two best-known landmarks are the Church of St Mary and the Post Mill. Wrawby is mentioned in the Domesday Book and its name is one of the many in this part of England derived from old Danish. People have lived and farmed here for much longer than that however, and the Local History Group, with the assistance of Scunthorpe Museum and specialist archaeologists, have uncovered evidence of an Iron Age enclosure and Romano-British farm buildings. For more information see the Local History Group Page. The present population of Wrawby is around 1,500 in about 600 homes. Wrawby has a Church of England Primary School, also called St Mary’s, a garage, two pubs and a farm shop selling eggs and vegetables. For more information, see the Wrawby Wikipedia page. In 2012, in the aftermath of the Olympic Torch visit, a Village Information Board was erected near the Church, along with a flower bed, a commemorative bench and a millstone. It's where the village pond used to be, as this old postcard shows. We have our own large online interactive version in which you can click on the various numbered buildings to see more information about them. Try it here.